This video was taken while approaching the Kejimkujik site. It starts with the motion and sound of water. Seabirds fly about and their songs are heard. Then it shows bird’s eye views of the grounds and images of the inner forest. The scenes are interspersed with close-ups of some carvings, including a canoe, a hand, a fish and a whale. The video concludes with a view of the lake, with the forest and body of water extending as far as the eye can see. Kejimkujik National Park and National Historic Site is located in southwestern Nova Scotia. 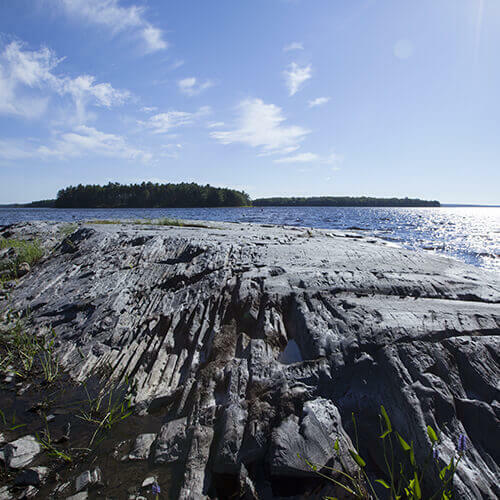 More than 500 petroglyphs have been found on four different sites around Kejimkujik Lake and George Lake. These carvings created on slate mainly document Mi’gmaq lifestyle between the 17th and 19th centuries. 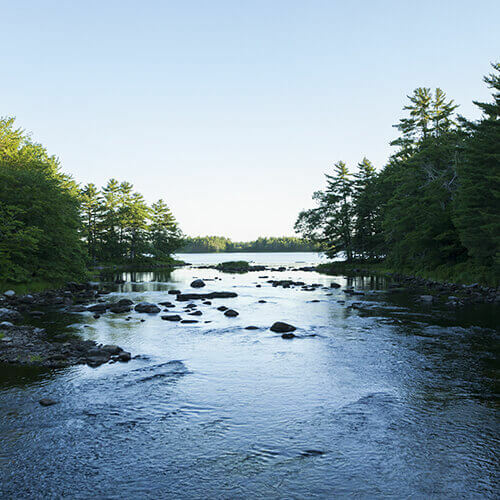 Kejimkujik is situated on the traditional territory of this Indigenous nation. The environment of Kejimkujik unfolds into a multitude of lakes and rivers that wind their way around rolling hills. The area is covered by the Acadian forest interspersed with wetlands: bogs and floodplains. 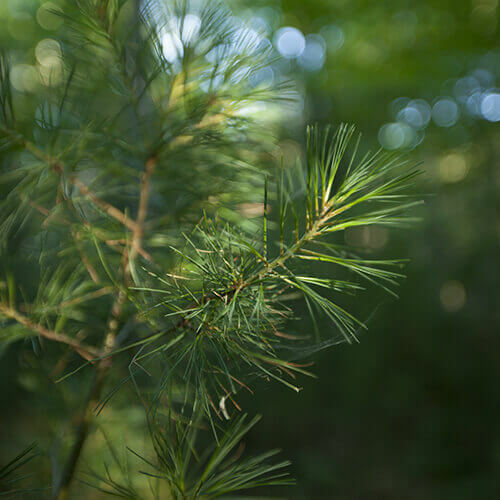 The lush mixed-wood forest is comprised of softwood species, including Eastern hemlock, red spruce and Eastern white pine and hardwood species, including red maple, sugar maple, beech and yellow birch. 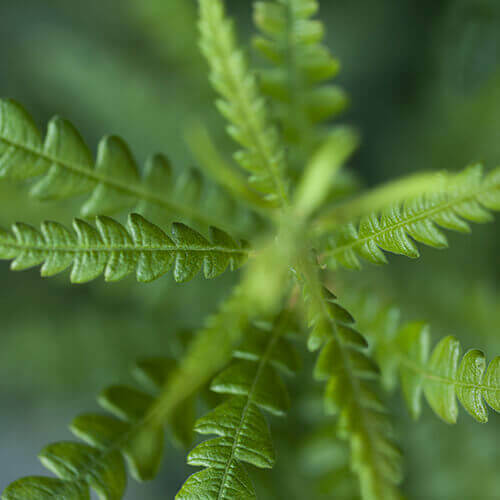 The wide variety of plant life consists of many fern species such as cinnamon fern, orchids called common lady's-slippers, and water plants such as fragrant water-lilies. Wildlife is thriving with white-tailed deer, beaver, porcupine, black bear, coyote and three bat species. Some 200 species of birds have been recorded in the park, including common loon, barred owl, Canada warbler and grey jay. This area is also home to a variety of amphibians, reptiles and fish. 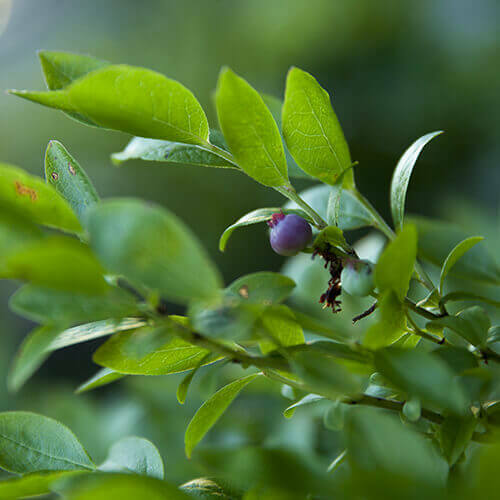 The exceptionally rich biodiversity of the area and adjoining sectors also includes several threatened species, such as water pennywort, Blanding's turtle and chimney swift. Owing to its wealth of natural heritage, this part of Nova Scotia was designated Southwest Nova Biosphere Reserve by UNESCO in 2001. 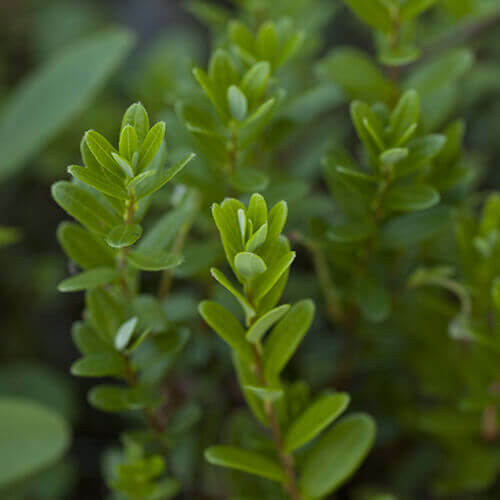 The climate is continental, with small variations between summer and winter temperatures due to the influence of the Atlantic Ocean. In summer, the average temperature is 18˚C, while in winter, temperatures are around -5˚C. Annual average precipitation of rain and snow ranges from 1200 mm to 1400 mm. The exact meaning of this Mi’gmaq place name is ambiguous. The name of Kejimkujik Lake was translated by Reverend Silas Rand in the 19th century as “swelled parts.” Historical novelist Thomas Raddall suggested the translation “the stricture passage,” referring to the lake outlet where the waters swelled because of stone fish weirs built to catch fish. According to some Mi’gmaq, including medicine man Jerry Lonecloud, the name Kejimkujik refers to men’s “chapped and swollen testicles” due to strenuous paddling needed to cross this vast lake. From yet another source, this lake was known as Fairy Lake in the 19th century. One of the petroglyph sites is located in Fairy Bay. Based on some Mi’gmaq oral stories, fairies are short beings endowed with supernatural powers who live in the rocks near water. They are said to be the creators of the rock carvings. The Kejimkujik rock art sites are linked to the Mi'gmaq. They are hunter-fisher-gatherers of the Algonquian language family. Their traditional territories span the Maritime Provinces and the Gaspé Peninsula. 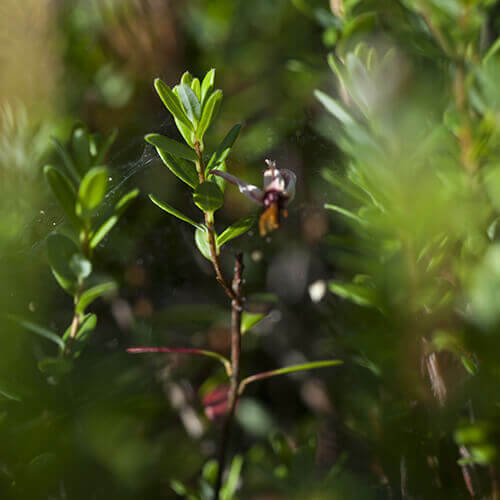 Kejimkujik is a cultural landscape of considerable importance for the Mi'gmaq, because their ancestors have lived, hunted and fished on this land since time immemorial. The long-standing significance and use of the land by the Mi’gmaq is documented through oral tradition and the countless archeological sites identified: campsites, fish weirs and burial sites. Traditional hunting grounds and ancestral trails, both on land and water, allowed them to travel the land. The video shows Mi’gmaq guide Donna Morris talking about the Kejimkujik site. Standing on the banks of a lake, she describes the surroundings of this site, with hills looming in the background above the lake. [This account of the coming of the white man, revealed to a young woman in a dream, was related to Silas Rand by Josiah Jeremy, a Mi'gmaq, Sept. 26,1869. It is taken from Legends of the Micmacs, by Silas Tertius Rand, edited by Helen L. Webster, New York and London, 1893]. When there were no people in this country but Indians, and before any others were known, a young woman had a singular dream. She dreamed that a small island came floating in towards the land, with tall trees on it, and living beings, - among whom was a man dressed in rabbit-skin garments. The next day she related her dream, and sought for an interpretation. It was the custom in those days, when any one had a remarkable dream, to consult the wise men, and especially the magicians and soothsayers. These pondered over the girl’s dream, but could make nothing of it. 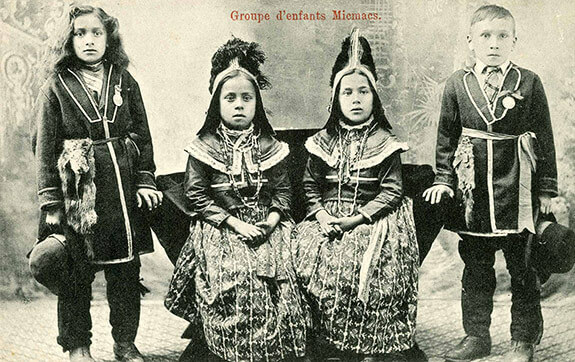 The Mi'gmaq have been in contact with Europeans – Portuguese, French, and then English – since the 16th century. 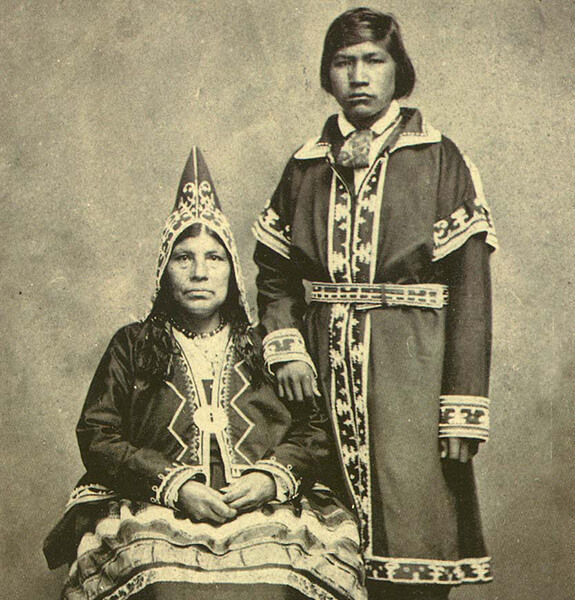 Their relationships marked by trading and cultural mixing exposed the Mi'gmaq to new philosophical and religious ideas, new techniques and material goods, but also to foreign diseases. 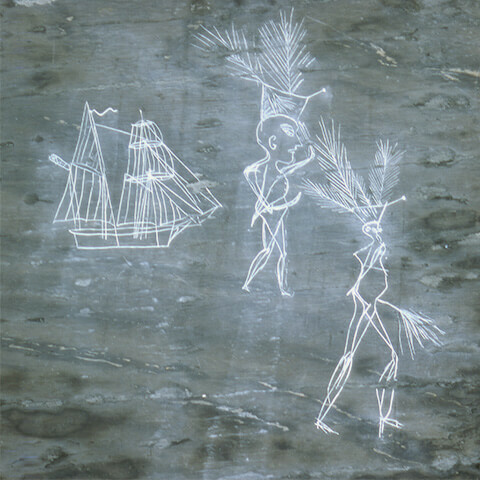 The Kejimkujik petroglyphs are historical reminders of the encounter between the Mi'gmaq and Europeans, such as the French who established Port-Royal (the capital of Acadia in the 17th century, now known as Annapolis Royal). 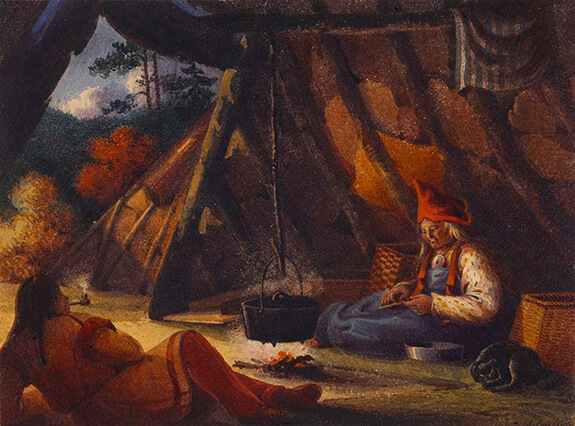 Among the depictions of the traditional Mi'gmaq way of life are animals, hunting and fishing scenes, canoes, clothing items, traditional designs and figures from oral stories. Numerous representations of Europeans and their ships and weapons were also found at the site. The carvings can be dated back to the 18th and 19th centuries. However, some of them may have been created by Europeans who had been coming to the region to hunt, fish and harvest wood since the 17th century.. Motifs revealed by water... Mi'gmaq guide Donna Morris showing a few petroglyphs on the banks of Kejimkujik. Mi’gmaq guide Donna Morris leads the camera onto the rocks of the banks of Kejimkujik, where many petroglyphs were carved. Moving from one image to the next, she splashes water over the carvings to reveal their contrasts. In addition to using her hands to highlight the details that she describes, close-up stills of some of the petroglyphs are shown. 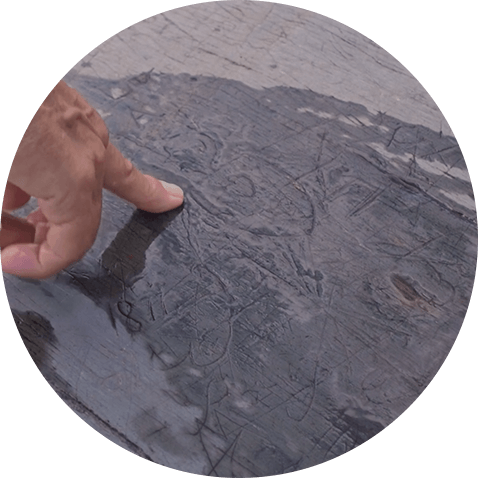 The Kejimkujik petroglyphs, carved in fine lines on slate, tend to fade over time and become very hard for the naked eye to see. However, park guides can “magically” bring them back to life simply by splashing water over them. Brian Molyneaux is an archaeologist (anthropologist) at the University of South Dakota, United States. He is an expert in prehistoric art and society and human use of the landscape. 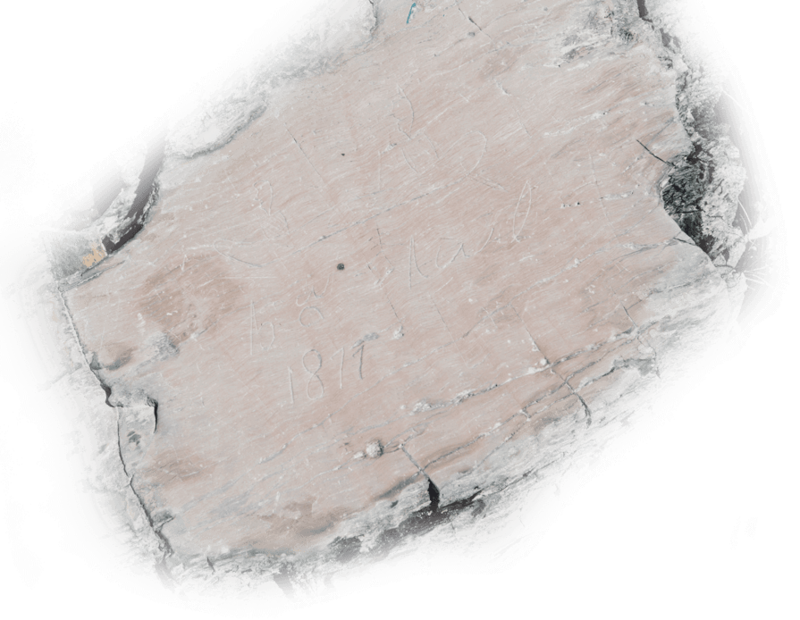 In his comments, he highlights that several carvings at Kejimkujik date back to the post-contact period and bear witness to the encounter between Indigenous and European cultures. Brian Molyneaux is an archaeologist (anthropologist) at the University of South Dakota, United States. He is an expert in prehistoric art and society and human use of the landscape. 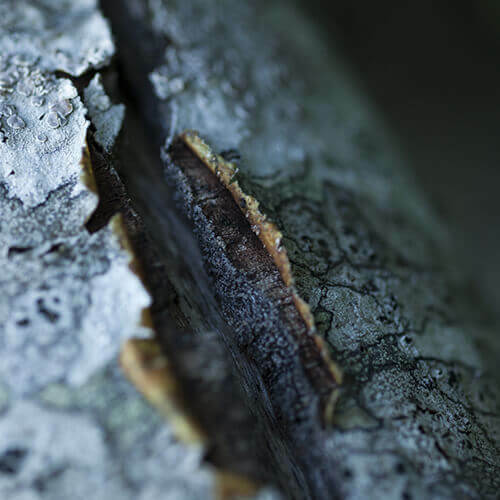 In his comments, he highlights that several carvings at Kejimkujik date back to the post-contact period and bear witness to the encounter between Indigenous and European cultures. Many of these rock art representations speak clearly of the sharing of cultures: European ships, firearms, Mi’gmaq women’s and men’s clothing made with European fabrics, and visual reminders of Mi’gmaq embracing Christianity. 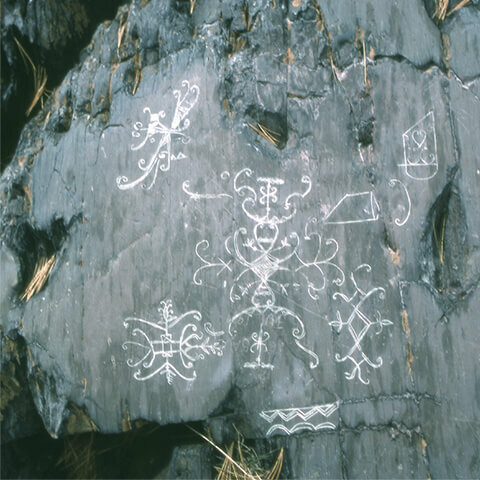 This image of complex curvilinear motifs found at the Fairy Bay site, on the shores of Kejimkujik Lake, has been interpreted as being a Mowiomi, a traditional summer gathering. 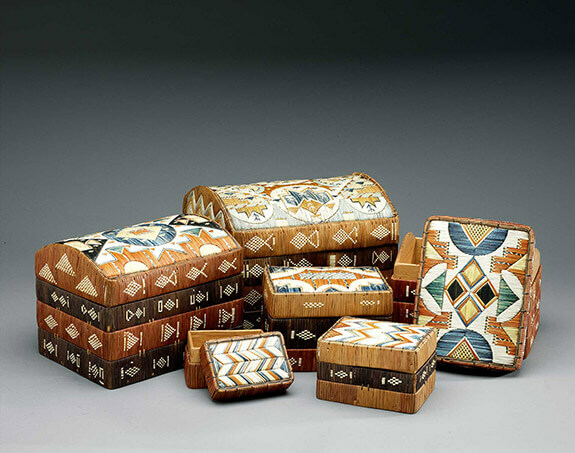 These five carved motifs may represent members of the Wabanaki Confederacy. The Confederacy included Mi'gmaq, Wolastoqiyik (Maliseet), Peskotomuhkati (Passamaquoddy), Waban-Aki (Abenaki) and Penawapskewi (Penobscot). It was created in the 17th century. 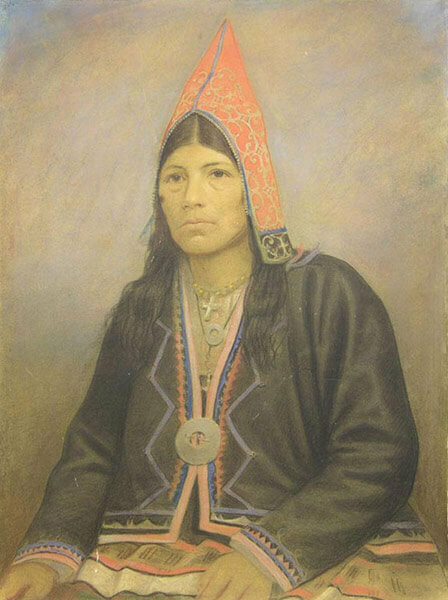 Its members were involved in wars against the Haudenosaunee (Iroquois) and raids during the American Revolution in the 18th century. 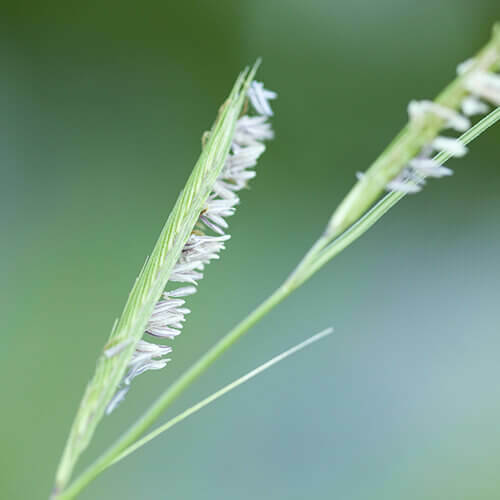 This photograph shows some double-curve motifs. Two women’s peaked caps are also engraved on the upper right side of the rock. Images of watercrafts abound at Kejimkujik, whether traditional birchbark canoes or European vessels. 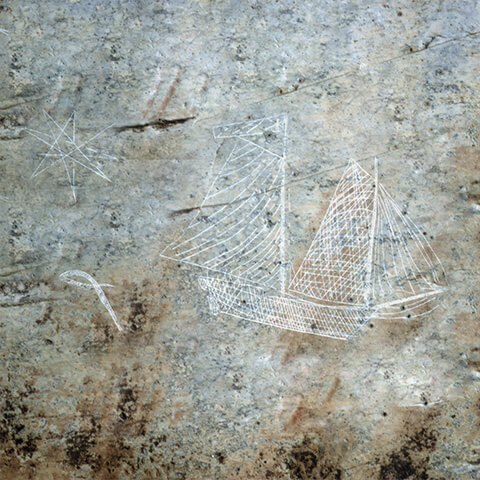 The number of sailing vessels depicted reveals their importance to the Mi'gmaq people and the newcomers. They are actually more represented than canoes. As highly skilled sailors, the Mi'gmaq could easily manoeuvre these boats in the 17th and 18th centuries. 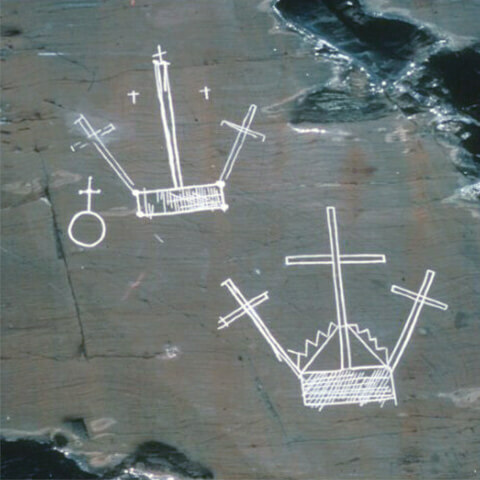 At this George Lake site, a schooner and a snake were engraved in a similar crosshatching style suggesting the work of a single author. Many other images at Kejimkujik feature the same theme of snake and boat. Snakes were often linked to the underwater world. 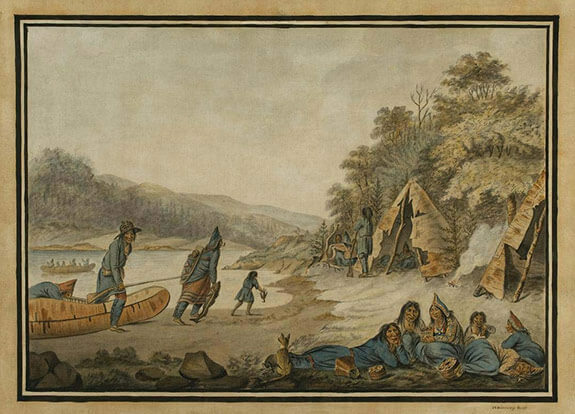 These representations, located at the Peter Point site on Kejimkujik Lake, likely date to the period of British colonial rule (end of the 18th and beginning of 19th centuries). 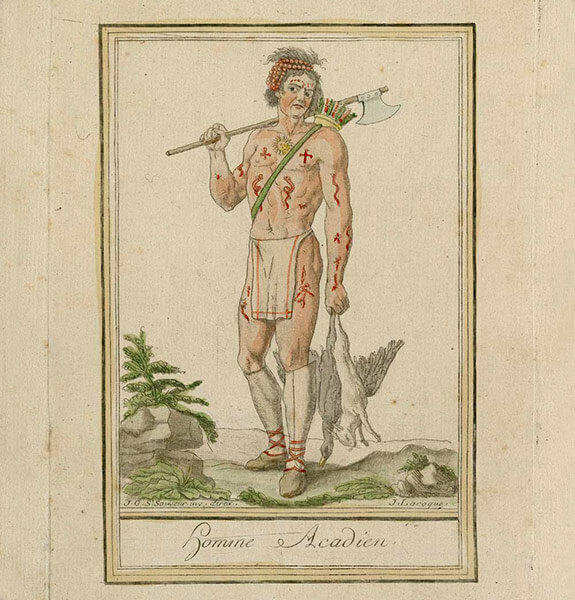 The scene features a sailing vessel and two Mi'gmaq men wearing tricorne (triangular) hats, with their brim turned up and decorated with feathers. One man is wearing a tailcoat and carrying a cutlass, a type of sabre popular among sailors. 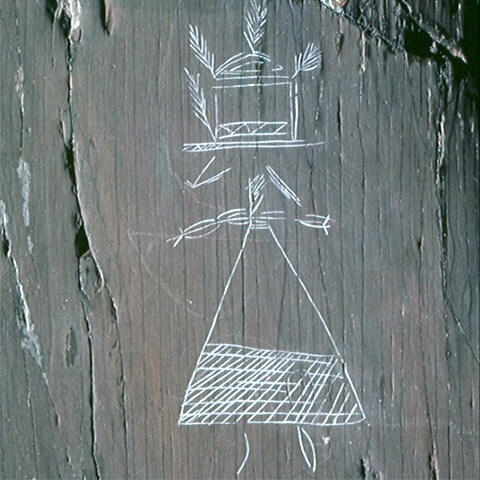 This image of a woman’s peaked cap, located at the Fairy Bay site, is among some sixty similar representations incised on the shores of Kejimkujik Lake. The size of these representations varies generally between two centimetres and about half a metre. This is the largest one in the Park. It features the double-curve motif. 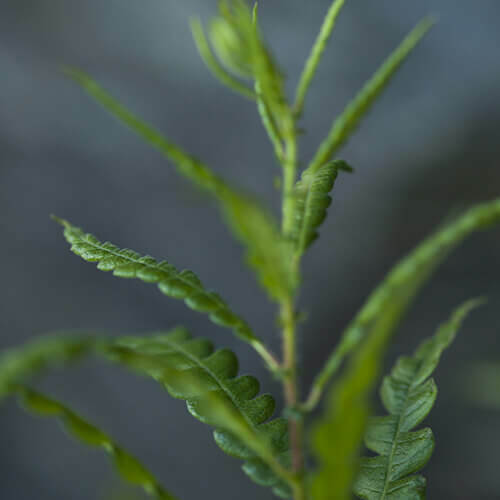 Numerous lines form the feather or evergreen twig decorating the central part of the cap. 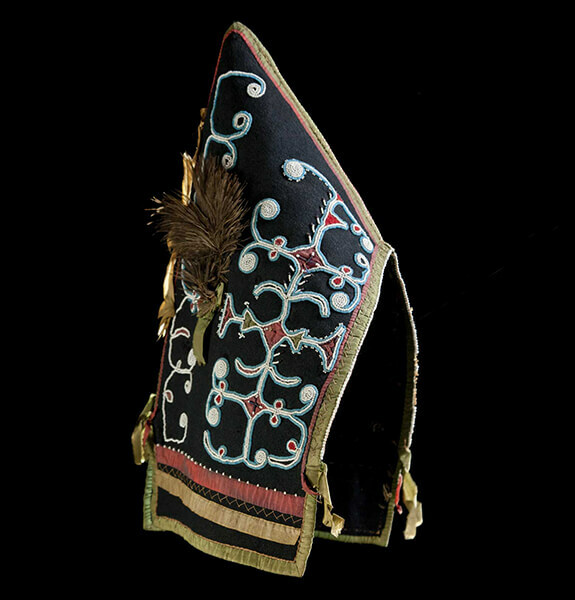 Worn in the 18th and 19th centuries, these caps, indicated the social status of individuals. 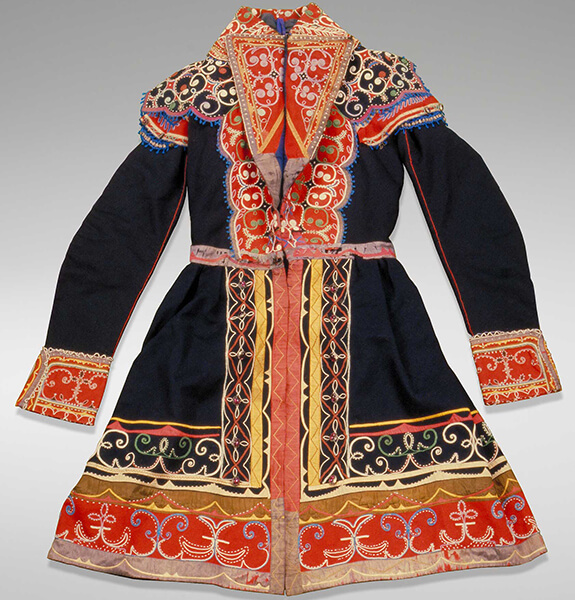 New materials introduced after European contact, such as wool and cotton, were used to make these caps, while decorations of glass beads and silk ribbons were added to recreate traditional geometric motifs. 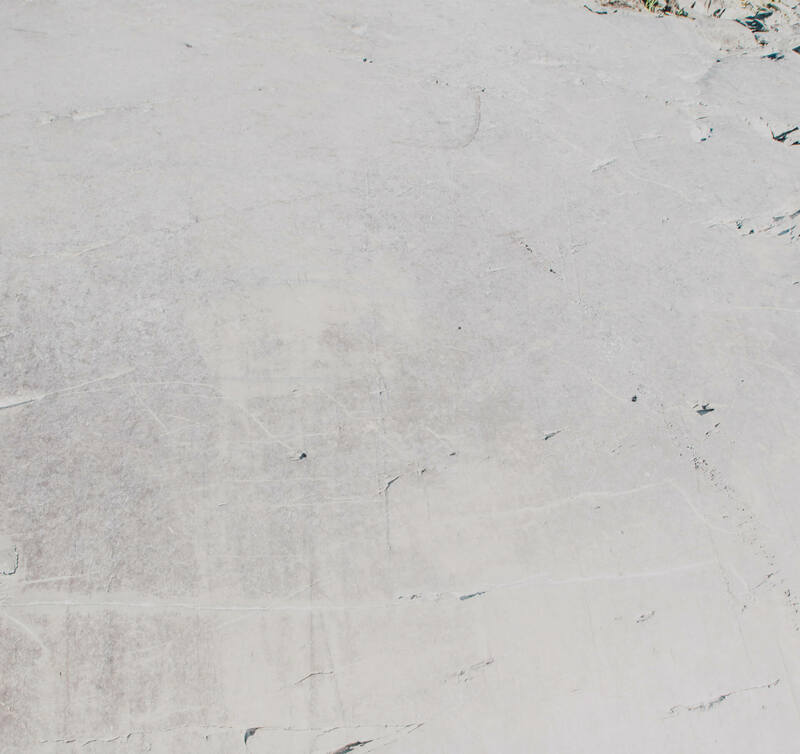 This human figure engraved on the rocks at Fairy Bay has a somewhat mysterious appearance. 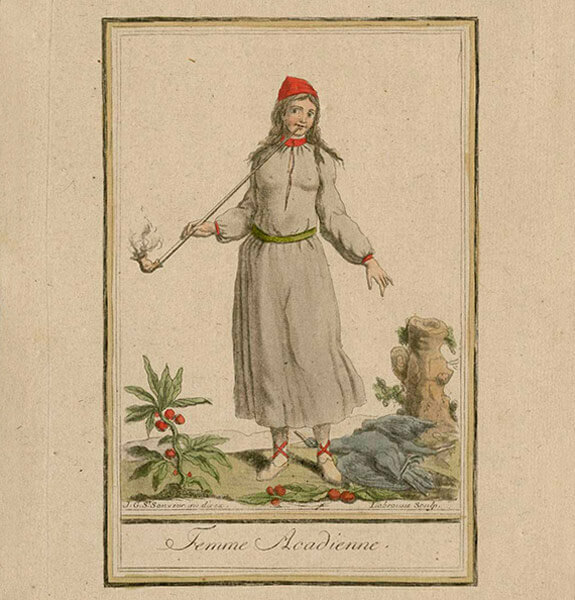 This individual has been described as a medicine man in the past, although it may be a woman wearing a traditional dress and a top hat decorated with motifs and feathers. 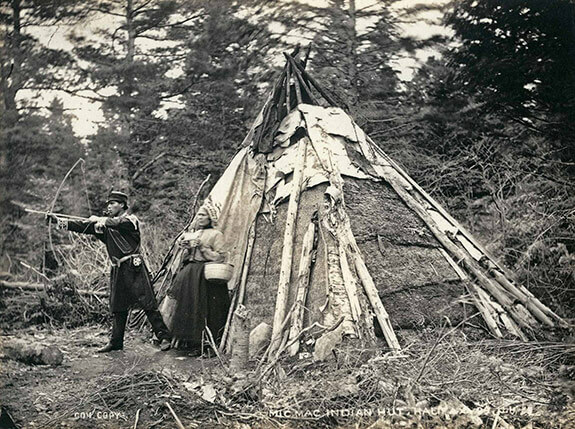 Among the oldest dates engraved at Kejimkujik Lake the year 1877 seems to bear a particular significance. This date is reproduced sixteen times at Fairy Bay and is associated with hunting scenes, sailing vessels, names or footprints. At Kejimkujik, both Mi’gmaq and English inscriptions are found on rock art sites. Mi’gmaq writing was developed from mnemonic characters and ancient pictographs. This writing system is known as komkwejwika'sikl or “sturgeon writing” because the characters look like the traces left by sturgeons in the mud. The name “Jim” is carved a few times at Fairy Bay. 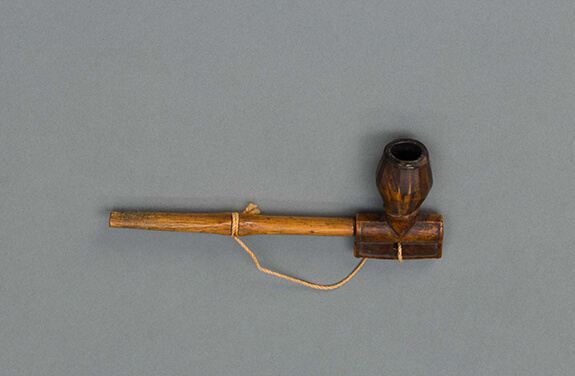 “Jim” is most likely the person smoking the clay pipe, which became widely used after European contact. 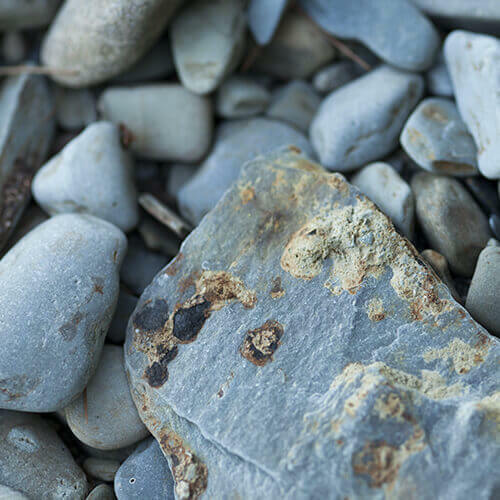 The adoption of the new Catholic faith by the Mi’gmaq is also represented on the rocks at Fairy Bay featuring depictions of crosses, altars and churches. The cross has a deeper significance for the Mi’gmaq people, and its symbolic use predates the arrival of Europeans. In the seventeenth century, French missionary LeClercq related that the cross was used as an emblem by the Mi’gmaq of Miramichi (New Brunswick). 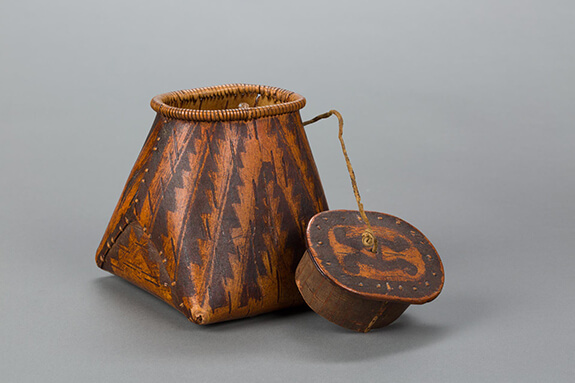 This symbol was found on clothes, wigwams and snowshoes. Crosses were erected during councils or placed in canoes on journeys. They were also used to mark places favourable for hunting and fishing. Today, the flag of the Mi’gmaq Grand Council includes a cross symbolizing the Christian faith as well as the four cardinal directions that are sacred to many Indigenous peoples across North America. Brian Molyneaux tells us about his research in Kejimkujik. He also describes the techniques he used to record a fragile heritage. 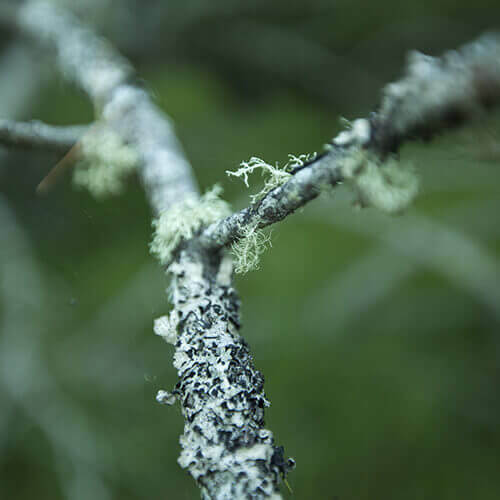 In this recording, Brian Molyneaux tells us about his research in Kejimkujik. He also describes the techniques he used to record a fragile heritage. Colleen Day, Senior Conservator at the Collections, Curatorial and Conservation Branch of Parks Canada, talks about the conservation of the Kejimkujik petroglyphs. She discusses the various means used to record and archive the carvings, such as Mylar film. 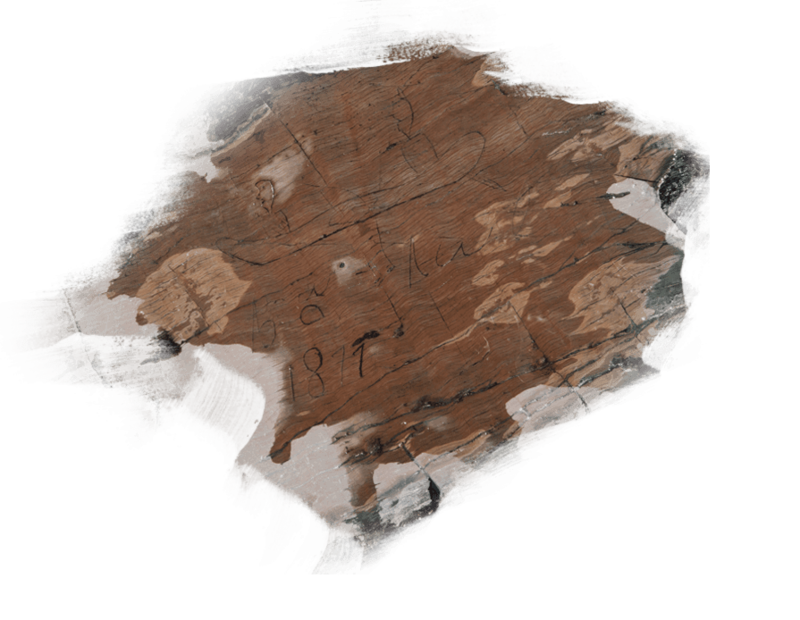 This very thin paper was used to trace the lines of a petroglyph representing a caribou. Direct tracings of petroglyphs were done in 1988 and 1989 on a durable, transparent plastic sheet commonly known as "Mylar film." 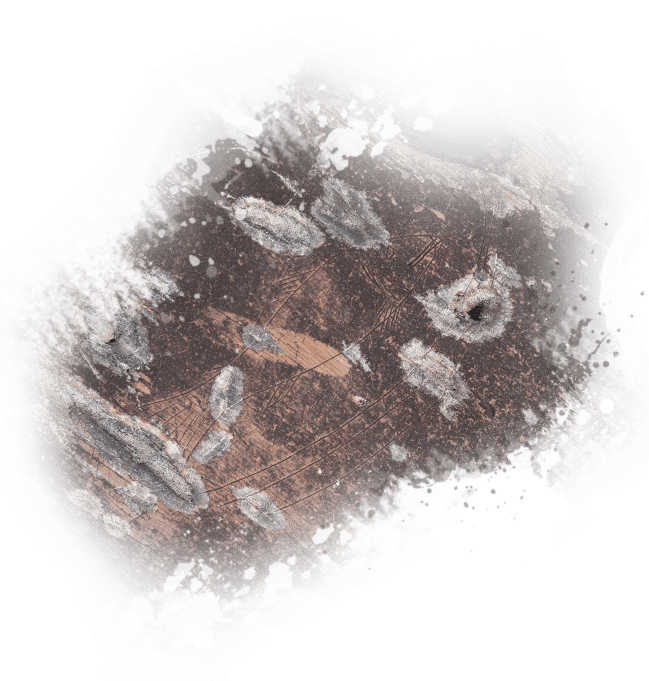 Sometimes, tracing petroglyphs involves making a decision: is a line part of the image or a natural feature of the rock? To record the images and avoid uncertainty, white silicone moulds of images were made in 1992 and 1993. 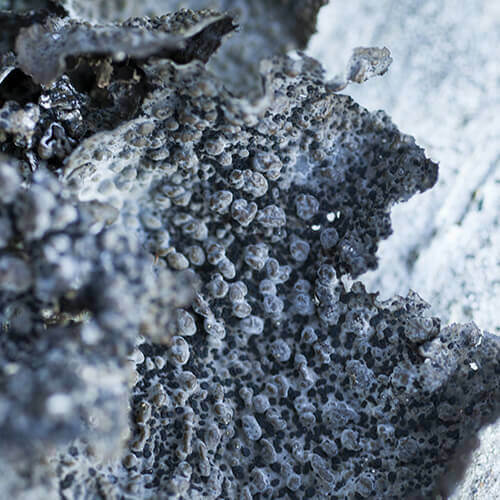 Silicone moulds create a direct copy of the rock surface. 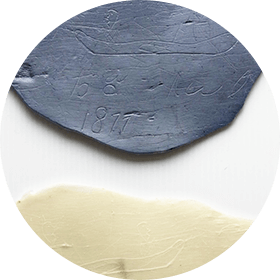 This silicone mould and the associated painted cast preserve the image of a porpoise hunt. The moulds are used to create silicone casts that are then painted to reproduce the rock surface and better enhance the faint lines. Guides at Kejimkujik Park use these casts to show the faint petroglyphs to the public. 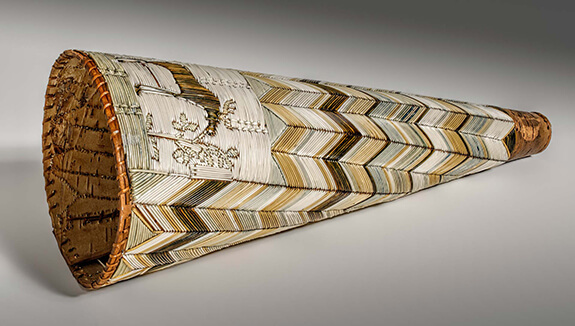 This painted cast with two canoes corresponds to those drawn on Mylar film. Silicon moulds shrink over time and they are negative images (reversed) of the petroglyphs. 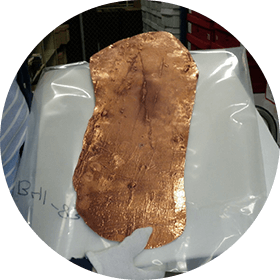 To create permanent records of the images and positive images of the petroglyphs (same as on the rock surface), copper plates were created from the moulds. These plates are archived. 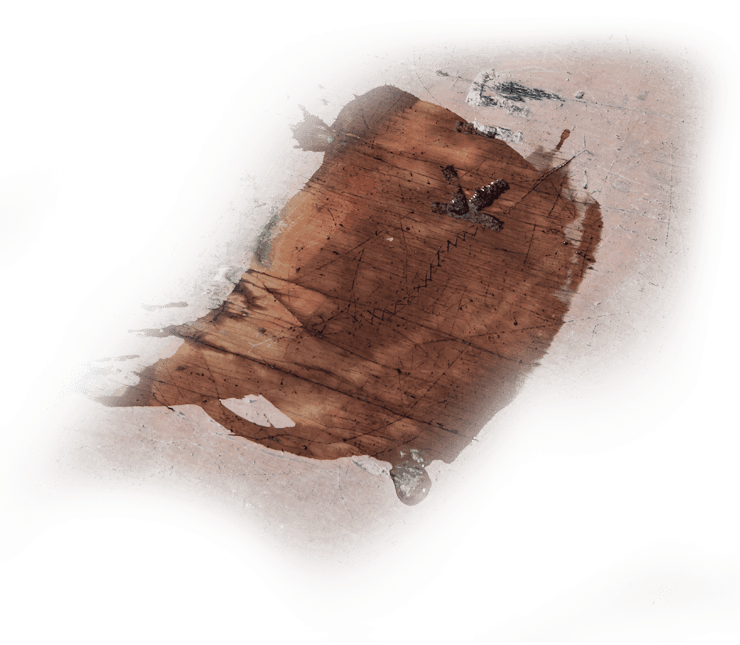 This is a copper plate of the faint image of the two canoes. A few carvings on the shores of Kejimkujik Lake were identified in 1873 by Joseph More, who reported them in his book History of Queens County. More’s brief descriptions and a keen interest in Mi’gmaq culture inspired George Creed (1829-1899), a postmaster living in South Rawdon. Creed decided to visit the site and draft the first detailed records of the carvings along the shores of Kejimkujik Lake and McGowan Lake (a lake east of the National Park). He completed his work in 1887-1888. 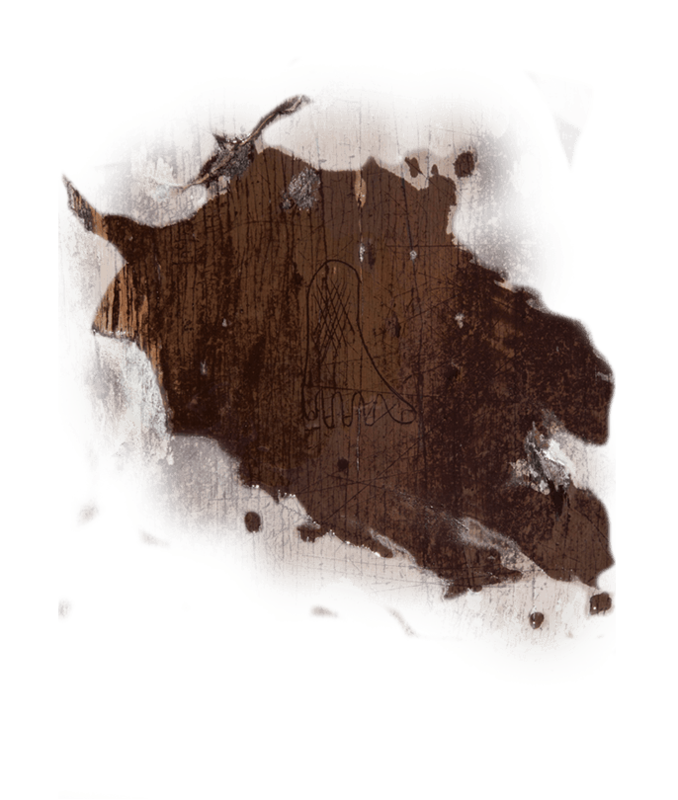 Creed used a special method by tracing the outline of the petroglyphs with an aniline pencil and pressing moist paper against them. Moisture helped transfer the pencil ink onto the paper. This technique created a mirror – or inverted – image of the carvings. 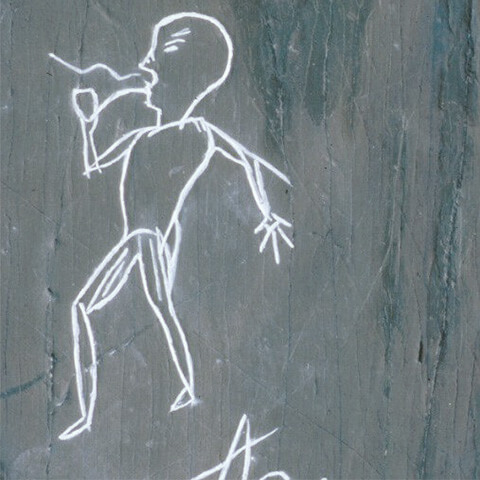 Creed was the first to document rock art in Nova Scotia. Compelled by his desire to preserve those fragile depictions from harsh weather conditions and vandalism, Creed created a work of legacy. The McGowan Lake carvings are now under water due to a hydroelectric dam built in the 1940s. Creed’s invaluable tracings are kept at the Nova Scotia Museum. The next day an event occurred that explained all. Getting up in the morning, what should they see but a singular little island, as they supposed, which had drifted near to the land and become stationary there! There were trees on it, and branches to the trees, on which a number of bears, as they supposed, were crawling about. 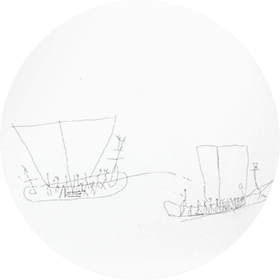 They all seized their bows, arrows, and spears, and rushed down to the shore, intending to shoot the bears; what was their surprise to find that these supposed bears were men, and that some of them were lowering down into the water a very singularly constructed canoe, into which several of them jumped and paddled ashore. Among them was a man dressed in white, a priest with his white stole on, who came towards them making signs of friendship, raising his hand towards heaven, and addressing them in an earnest manner, but in a language which they could not understand. The girl was now questioned respecting her dream. Was it such an island as this that she had seen? Was this the man? She affirmed that they were indeed the same. Some of them, especially the necromancers, were displeased; they did not like it that the coming of these foreigners should have been intimated to this young girl, and not to them. Had an enemy of the Indian tribes with whom they were at war been about to make a descent upon them, they could have foreseen and foretold it by the power of their magic; but of the coming of this teacher of a new religion they could know nothing. The new teacher was gradually received into favour, though the magicians opposed him. The people received his instructions, and submitted to the rites of baptism; the priest learned their tongue, and gave them the Prayer Book written in what they call abootûlooeëgâsîk’ (ornamental mark-writing); a mark standing for a word, and rendering it so difficult to learn that it may be said to be impossible. My name is Brian Molyneaux. I am an archaeologist. As far as what happens when you have all of these images, hundreds of images, you know, we present to the world, I think the important thing to remember is that Kejimkujik has been occupied first by the First Nations, who occupied the lands before all of the different explorers and settlers. And then, it was occupied by succeeding waves of people, whether they lived there, whether they came in to hunt and fish. And so the rocks are witness to an enormous amount of cultural use over time, and I think that it’s almost impossible to, you know, say that petroglyphs of Kejimkujik date from any particular time period. I think that we see, we know for sure, that there were petroglyphs that were carved in the 19th century; we know that they were carved in the 20th century. I have speculated in print in a couple of articles that there may be petroglyphs from the 18th century. But, I think that you can’t know, and that’s one of the things that will always be mysterious. If you find a moose carved on the rock, that moose, you know, could be the record of an eye witness, or it could be a memory. There’s no way of actually knowing, and that’s just part of […] I guess of the special nature and the mystery that will always, always persist. Kejimkujik petroglyphs capture a period of at least a hundred years or more of the whole culture of the area. It would be wrong to think of Kejimkujik strictly in terms of the Mi'gmaq people, who are of course the original inhabitants, and of course they continue to […] see and experience these areas as part of their homeland today. But it is also part of the life experience of all the people who came after. And so Kejimkujik has wonderful sailing ships. There’re some very detailed 19th century sailing ships, and I am convinced that […] you know, they are, some of them, carved by Europeans or people who are experienced with sailing. There’s no reason to say that other people were not equally fascinated by those rocks, as we know from the amount of graffiti that you can find there. So, I think in that sense it’s quite unique because it […], and also because it captures language. I mean, you have Mi'gmaq script on the rocks. So it’s more integrated with the history of the area then, for example, the rock paintings of the Canadian Shield, which were very personal, very much tied to Anishnaabe […] spirituality and life. The ones in Kejimkujik, in many instances, are pictorial. 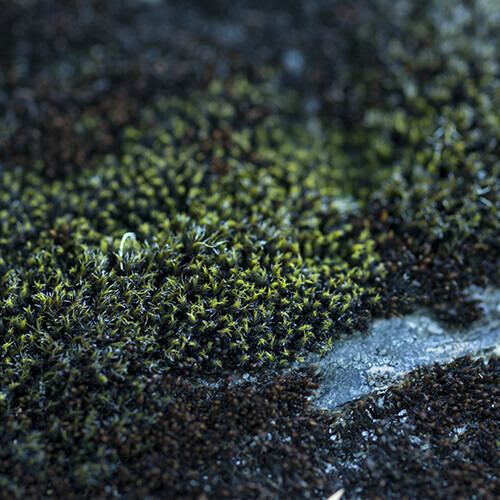 The ones I’ve seen, extraordinary pictures there of tent camps and settlements, houses, rows of houses are scratched on the rocks at McGowan Lake. It’s extraordinary how much of the period of the 19th century, […] you know, in the minds of the people who traveled to this area, how much of it they put on the rocks, and so that makes it very unique. I’d also like to say one other thing about Kejimkujik, and that is that what we see is only what now survives. These rocks have been there for thousands of years exposed, and we know that erosion kind of wipes the slate clean, you know, over, you know, decades. And so, it’s curious to wander about what might have been there before. We know that in other places, rock art goes back thousands of years. Why not at Kejimkujik? 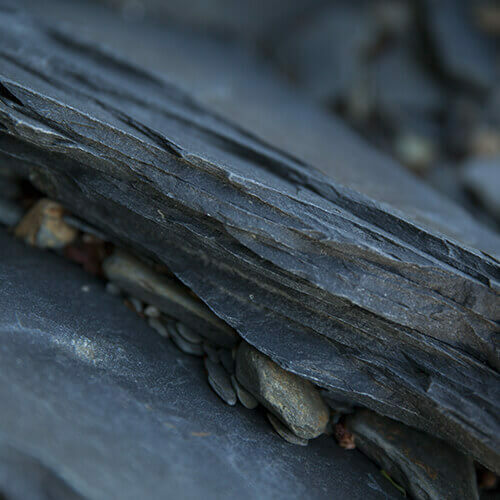 Why not lying undiscovered under parts of the shoreline, where the rocks extend? 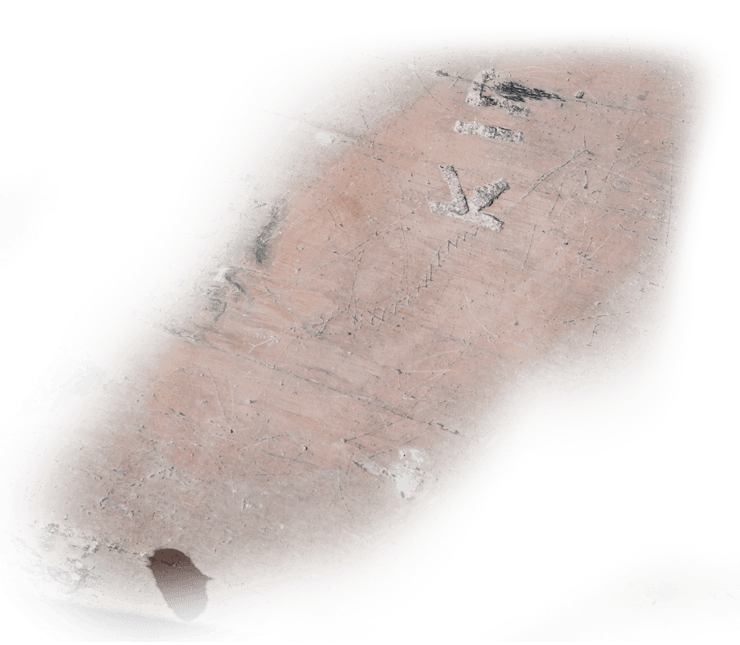 Who’s to know what might exist that’s been protected over the centuries by soil, or who’s to know what was carved and is now gone. In that sense, it will always have mysteries, and there will always be things to discover. One of the fascinating things about Kejimkujik is that you don’t see the petroglyphs, or at least you don’t see the petroglyphs that occupy our interest and curiosity. 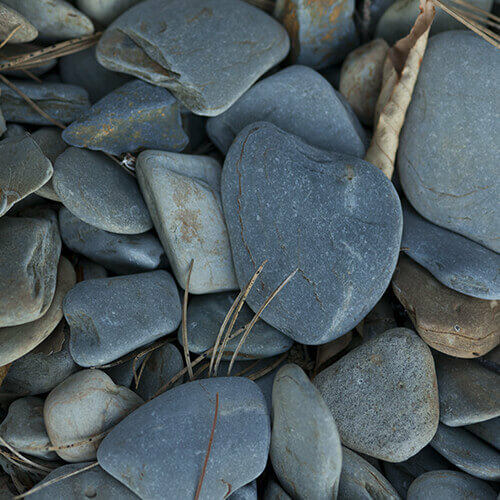 You see graffiti scratched on the rocks, anything that’s been done recently, because the slates are so smooth and so soft that anyone can scratch anything on the rock, and produce an image. The real mysterious, curious […] ancient imagery, you have to search for, and you have to almost create yourself […] It’s not something that […] you know, jumps out at you. You have to search. It’s a quest to see the petroglyphs. 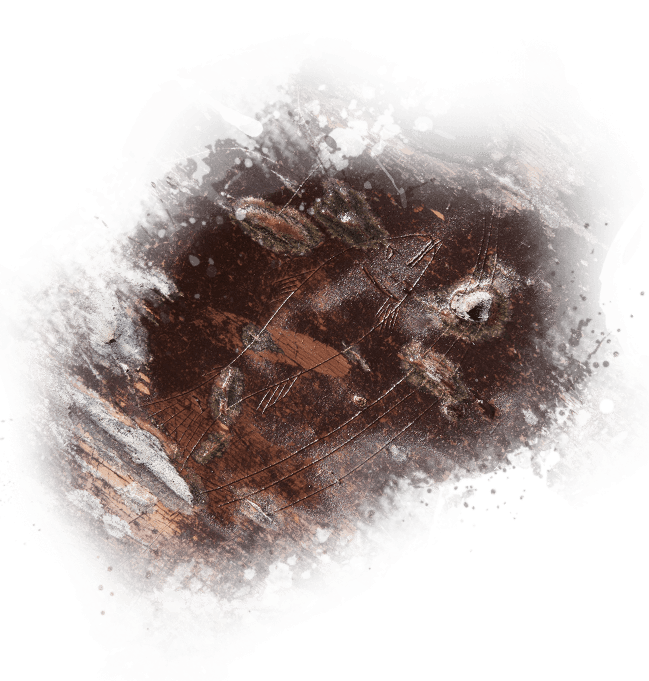 So my first images were actually in the dark, because as an archaeologist, I was very interested in trying to put as little of myself as possible in the interpretation of what I was looking at, in for example rock art, prehistoric rock art. And so, I wanted to be able to perceive the imagery directly, and the way you do that is at night, with a flashlight held at an angle. And what seems like a smooth rock suddenly comes alive. And the images come out at you because they’re defined by shadows, minute shadows in the smooth rock, and that’s how I first saw the Kejimkujik petroglyphs. And it was a profound experience that I will never forget. Now, as far as the research, my goal, and this is what I was asked to do by Parks Canada, was to make a record, just as careful records as possible of the imagery, and the way I did it was to develop a technique that I got from previous workers. What they’ve done was they had traced the lines with some water-soluble paint with very fine paintbrush. But, I prefer to work at night, in the dark, because that way you were not doing as much interpretation, because whatever line show up you paint, and it’s only then, when you finish painting, that you see an image. 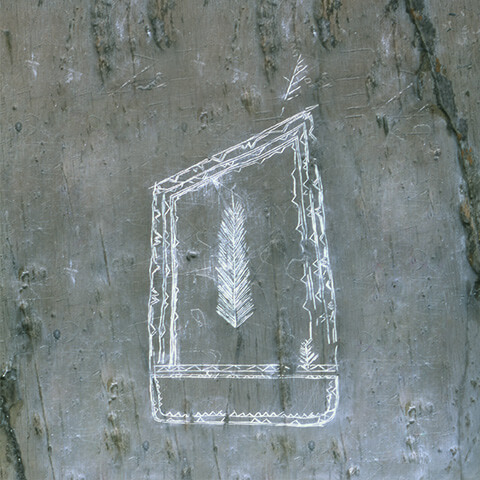 You don’t look at a petroglyph and say “oh there’s a canoe, I think I’ll outline that canoe.” You look very, very closely, and we looked using […] with magnification at night, and we would painstakingly trace tiny lines. And then, when we’d finish, we would draw back and light the surface and see what we had. 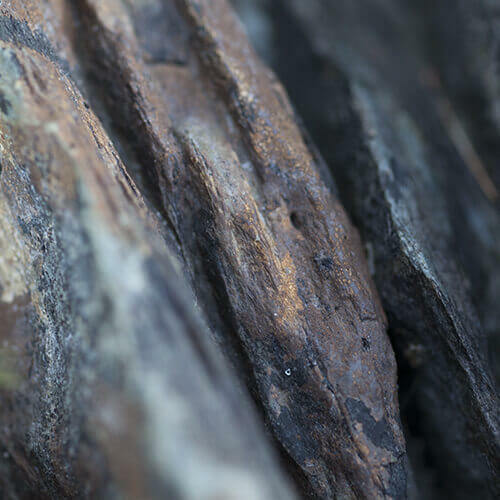 So it was a really […] a method of discovery, that was a little bit like archaeological excavation, traditional excavation, where things emerge out of the soil, well things emerged out of the rock. Recording the images, especially in the way that we did […], you know was, I think, very effective, and it gave us an intimate understanding of what actually is there. My name is Donna Morris, I am from the Shubenacadie First Nation reserve. The cultural landscape here within Kejimkujik Park and National Historic Site is significant to the Mi'gmaq people in this area, because in the early 1800s and way before, like 5000 years ago, there were Mi'gmaq people that had lived in this area. And, after Parks Canada was made in this particular area … Most of this area is protected now, so there’s a lot of First Nations people that can come in and visit the site that their ancestors or their direct family had once lived here, and they have open access to the park, and the petroglyph is a reminder of peoples in the past that had lived here at one time ago. And also, archaeological sites within Kejimkujik National Park National Historic Site also pertain to the landscape of the Mi'gmaq people. Fishing wears, fishing sites, hunting sites, encampment sites, and habitation sites all throughout this particular area. [Donna gestures with her arms and hands to emphasise her statements] So it’s very significant, it’s very significant to the Mi'gmaq people. People who were living here like 5000 years ago, 2000 years ago, 1500 years ago, they were living off of the water, they were living off of the land as well. Right here in Southwest Nova where Kejimkujik National Park National Historic Site is, it has all these different river systems going through or around Kejimkujik. […] These river systems were once old transportation routes used by First Nations people. So you can get into the Bay of Fundy on one area, and if you go on to the other side, you run into the Atlantic Ocean. And then of course you had relatives, you had acquaintances, you had family that lived on the […] on the shores. So you’re going to go down there on these river systems, you’re going to hunt for your Tommy cod, you’re going to hunt for your whales, your porpoise, your seals, and because you have acquaintances and people down there on the peripherals of the waters, you know, the water’s edge, you’re going to have those people that’s going to help you with this […] stuff that you’re catching. So, that you bring it back in […] into the interior, here in Keji. And there’s a lot of people that say […] the First Nations people they went and they lived on the shores in the summertime, and on the interior in the wintertime. If you were living here in this area 5000 years ago, there is no need for you to go inland, way, way inland. There is no need for you to go way out by the shores. You already have everything that you need. You have your lakes, you have your river systems, you have the fish, you have everything that you need. On the interior, you have your caribou, you have your moose, you have everything that you need there. So, of course it’s going to be logical that you’re going to live here, because it keeps the flies away, keeps the mosquitoes away. And in the winter time, move twenty meters inshore, inland, right? And it’s protection from the cold, from the waters. We have this little man right here. [Donna leans over and using her hand, covers the figure with water. She points her finger at the motif] Now this little man, I say, he’s a military man that goes back to the seventeen hundreds, [Close-up of the petroglyph] and if you see, he has a little French tam, [Donna touches with her finger the outline of the carving] the type that the French then used to wear. He has a shield with a heart and a little cross there. [Donna continues to explain while looking at the camera] And the French people that was down in this area were Catholics, and they were on very good terms with native people in this area. 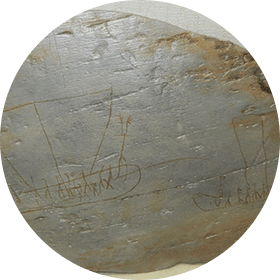 And over here next to this little man, what we have, [The guide gets up and moves slightly to the right side] and if we put some water on it, [Close-up of the petroglyph] this is a ship. So we’ll have this going here, put a little water on it like that, and here is the ship. [Donna splashes water on the motif with her hand, then she traces its outline with her finger] Here is the outline of it right here, here is the other outline right there, and here’s the hull. [Donna Morris gets up and points to another area to the left] And then down on the end here, [The guide walks on the rocks] I’ll take you right down here and show you this caribou. [The guide bends down and splashes water on a motif with her hand to make it visible] Here’s our caribou right here, and if you put water on this caribou, this image comes in really, really close. [Static shot of Donna Morris talking to the camera. In the background, a vast expanse of water] This is a caribou that was hunted way, way back in the sixteen, seventeen hundreds, eighteen hundreds, and it was around this area. The last one to be caught in Nova Scotia was in 1909 [Close-up of the caribou petroglyph] in the Cape Breton area. We don’t have any caribou here now. All we have is a white-tailed deer. My name is Colleen Day, I’m a conservator. I’m working for Parks Canada in the Atlantic region. If you do a risk assessment on the petroglyphs, there are two factors that are affecting them. One is people, because they’re very, very subtle on the rocks, so it’s very easy to drag a canoe over them, or decide that you’re going to scratch your own initials in them, or decide to do a rubbing of the ones you can see, and not know that you’re damaging it. So we’re trying to protect them from that by keeping people away, except when they’re with a guide, and doing an education effort to make sure that people know that they’re there and they know how important they are. The other factor that’s affecting them is the environment […] and that’s more difficult to protect them against, and keep them where they are. So what we’ve done is we have recorded them really, really thoroughly, and we treat the recordings as if they were an original artefact. 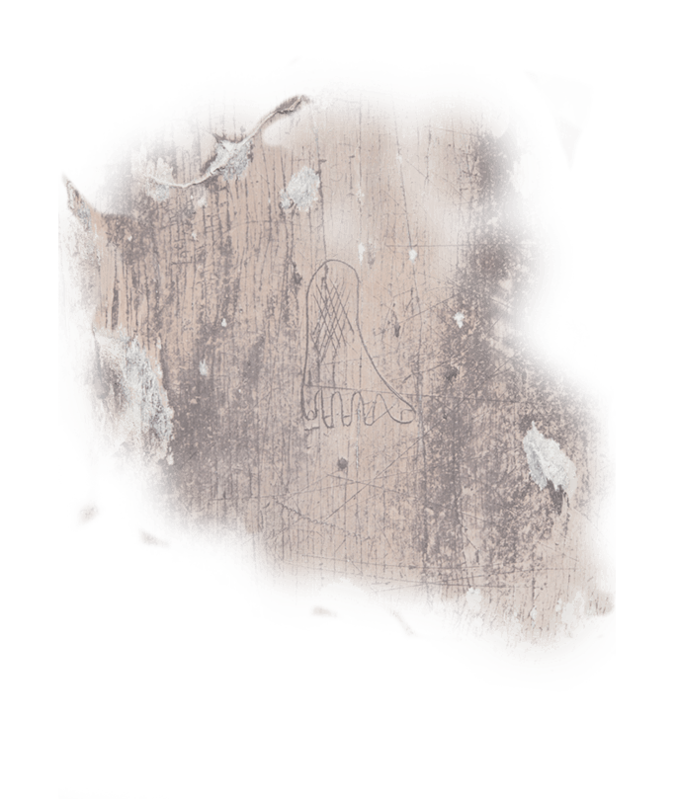 So we have a permanent archival record of the petroglyph [Dynamic shot focusing on a copy of a carving of two figures in a canoe] at, when that was done. For instance, most of them were done in the 80s, and we have an archival copy in the form of copper plate. [Static shot of Colleen Day] People have asked me for years how fast the petroglyphs are fading and […] a year and a half ago, I finally had an inkling of one way that we might be able to tell that. As part of their talk, the tour guides tell people why they’re not allowed to do rubbings. So somebody brought in rubbings that they had done when they were a child. Now, the note that came with [Colleen Day shows reproductions of carvings made on Mylar paper] it said that they were done in the 60s, but they very intelligently rubbed a penny when they did it. So, I can tell from the rubbing on this penny that it was actually done in 73. It includes this very famous image of the caribou, and I have this one as a rubbing in 73, but I also have it as the mylar tracing in 83. [Static shot of Colleen Day] Now, if I get those two images completely lined up, and I flip back and forth between them, I can see that there’s one more line in this caribou from 73 [Still frame of the caribou image slide] than there is in the caribou from 83 [Static shot of Colleen Day], which tells me that in that ten years, how much is been fading. If we had more of the rubbings, I think that we could tell more about how fast they’re fading. That’s another consequence, in that it made me realize that the mylars not only document the image, but they’re also time sensitive. So they’re exactly what the image was in 83. That means that we should keep them in an archival storage situation as well, because they provide information that you can’t get from the rock today.